Hydrostatic tests are conducted under the constraints of either the industry's or the customer's specifications. The vessel is filled with a nearly incompressible liquid - usually water or oil - and examined for leaks or permanent changes in shape. Red or fluorescent dyes are usually added to the water to make leaks easier to see. The test pressure is always considerably higher than the operating pressure to give a margin for safety. This margin of safety is typically 150% or 5/3 of the design pressure, depending on the regulations that apply. For example, if a cylinder was rated to DOT-2015 PSI (approximately 139 bar), it would be tested at around 3360 PSI (approximately 232 bar). This is to ensure maximum usage and to provide more safety. Water is commonly used because it is almost incompressible (compressible only by weight, not air pressure), so will only expand by a very small amount should the vessel split. If high pressure gas were used, then the gas would expand to perhaps several hundred times its compressed volume in an explosion, with the attendant risk of damage or injury. This is the risk which the testing is intended to mitigate. 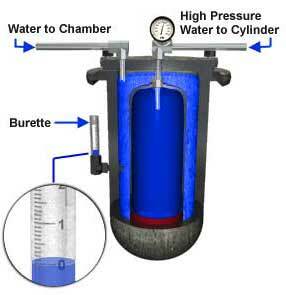 Small pressure vessels are normally tested using a water jacket test. The vessel is visually examined for defects and then placed in a container filled with water, and in which the change in volume of the vessel can be measured by monitoring the water level. For best accuracy, a digital scale is used to measure the smallest amounts of change. The vessel is then pressurized for a specified period, usually 30 or more seconds, and then depressurized again. The water level in the jacket is then examined. The level will be greater if the vessel being tested has been distorted by the pressure change and did not return to its original volume, or some of the pressurized water inside has leaked out. In both cases, this will normally signify that the vessel has failed the test. If the REE (Rejection Elastic Expansion) is more than 10%, or not up to DOT or customer standards the cylinder fails, and then goes through a condemning process dubbing the cylinder unsafe. This measures the overall leakage of a system instead of locating the leaks and additives can be added to the water to reduce resistivity and increase the sensitivity of the test. The hydrostatic test fluid can also clog small holes (1x10^-6 std cm^3/s or smaller) as a result of the increase in pressure. This is another reason why water is commonly used. All the information the tester needs is stamped onto the cylinder. This includes the DOT information, serial number, manufacturer, and manufacture date. Other information is stamped as needed such as the REE or how much the manufacturer specifies the cylinder should expand before it is considered unsafe. All this information is usually taken down and stored on a computer prior to the testing process. 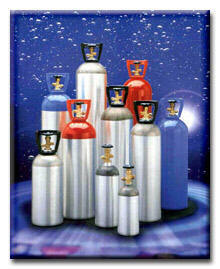 All this information is necessary for keeping track of when the cylinder has been or needs to be hydrotested.